In our four-part educational series, we have explored three important issues that manhole and handhole owners are currently facing: trespass, damage, and violations. All three can work against each other, creating inaccessible vaults and extremely unsafe vault conditions; likewise, the three can work together to make vaults safe and accessible. Watch the video below to learn how safety and access can work together, or against each other, in underground spaces. From the video, it’s evident that without safe conditions, accessibility is limited. The technicians who repair these spaces already have considerable risks. Without regular inspections, violations, damage, and trespass add up to create unsafe and inaccessible conditions. Below are three examples (among many others) of what can go wrong. Structural wall and roof damage is an illustration of how trespass, damage, and violations can build, while harboring unsafe conditions. When trespassers break into duct space, they often leave messy results. Core drills may go unfinished and knock-outs may be left uncapped, leaving fragile wall conditions. Sensitive wall conditions eventually affect the entire structure, such as the roof, and can create a serious possibility of collapse. Read our post on damage to learn more. Environmental contamination is a serious consequence of damage and violation. Not only do these conditions have negative effects on the vault space, they are a huge liability to workers and the public. In our inventory experience, we have found everything from animal and insect manifestations to leaked oil, and murky, hazardous water. Conditions like unsafe water may cause roadway sludge that has to be cleaned up. If the city catches these problems before a vault owners’ inspection team, it could be a huge financial burden to the asset owner. Similarly, if the environmental condition is bad enough, it could be a liability to surrounding residents. Improper entry access to vaults is another ramification of violation and damage expansion. 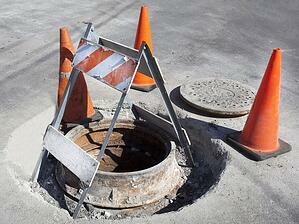 Improper entry access happens when rings are added to the column of the manhole to accommodate roadway paving. However, vault entrance ladders typically stay bolted in their original spot. This puts them out of reach for the underground workers, sometimes several feet down below ground level. Safety risks are increased significantly when access ladders are not brought up to the correct height. These conditions seem daunting and overwhelming. But there is good news for vault owners – we have a solution. Safety and access can work together to create better infrastructure for our communities. Owners have the right and responsibility to take care of underground real estate. Here are two key methods owners should practice regularly to take control of their vaults. Invest in routine inspections from a properly trained audit team. Keeping vaults safe for technicians and future workers is imperative for real estate success. Inventory teams should check and report all asset data, such as location, occupants, and current vault condition. They should also identify damage, violation(s), and trespass in every space. Finally, they should deliver real-time reports to the owners’ joint use management department, including photographs, notes, and additional information that the joint use team may need. For example, Alden delivers a post-inspection audit package to every joint use management department that we work with. We take all of the information collected, and show companies how to turn our findings into tangible, profitable results. Companies are shocked at how much revenue they can collect from trespassers. Talk to us to receive a sample closing package by following this link. Owners who use a centralized and shared joint use database can quickly gain the clarity needed about what’s happening in their own real estate. The days of manhole and handhole unawareness must end. With current industry changes, like rapid broadband deployment, it is crucial for asset owners to recognize the value of their vaults. It’s time to start applying modern technology to enable a thriving future. Data management through a shared and centralized asset management system paired with routine audits of manhole and handhole spaces is the best way to ensure quality, safety, and access. Keep your vaults safe. Make them accessible. What is your company doing to manage underground spaces? Share your thoughts on vault safety and accessibility below in the comments. Need help with managing safety and access? Contact Us.